T lymphocytes have critical roles in clearing cells expressing foreign antigens. The proliferation of T cells and their differentiation into effector and memory cells confers T cell-mediated adaptive immunity (Abbas et al., 1997). To undertake these antigen-specific functions, T cells require two signals: ligation of the T cell receptor (TCR) by the MHC/peptide complex on the antigen presenting cell (APC), and cross-linking of co-stimulatory receptors on the T cell with corresponding ligands on the APC (Carreno and Collins, 2002; Chambers and Allison, 1999). In addition, cytokines synthesized and released by the APC can modulate T cell functions in a paracrine way (Beginat et al., 2003; Kanegane and Tosato 1996; Lantz et al., 2000; Lodolce et al., 1998; Nakajima et al., 1997; Schluns et al., 2000; Unutmaz et al., 1994; Unutmaz et al., 1995; Zhang et al., 1998). 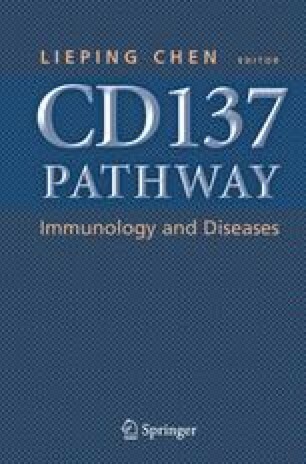 Although the exact mechanisms by which several co-stimulatory molecules can interact to stimulate T cells remain to be uncovered, co-stimulation appears to be an accurate process that subtly evokes T cell immunity (Rothstein and Sayegh, 2003; Samia and Mohamed, 2004; Van Parijs, and Abbas, 1998). Co-stimulatory signals determine whether antigen-priming T cells become fully activated or antigen-specifically inactivated (Samia and Mohamed, 2004). If the concentration of antigen or its affinity for TCR is low, co-stimulatory signals tend to enhance antigen-specific TCR signals and fully activate T cells by activating their own signaling pathways or enhancing those generated by the TCR (Gravestein et al., 1998; Kenneth and Thompson, 2002). Co-stimulation can promote both early antigen-priming T cell activation and late T cell differentiation to effector or memory cells (Michael, 2003). At the same time, negative co-stimulatory signals may prevent unnecessary activation of T cells and hence autoimmune responses (Rothstein and Sayegh, 2003; Samia and Mohamed, 2004).